MicroRNA, also known as miRNA, is a class of non-coding ribonucleic acid (RNA) which plays a vital role in the regulation of gene expression and also involved in RNA silencing. It is found in animals, plants and some viruses. Globally, development of efficient and advance technology, rise in the awareness among people regarding, increasing focus on research and development, growing government initiative across the globe, development of molecular biology and genomic technologies, and growing government’s healthcare funding are the prime growth drivers of global micro-RNA market. In addition, increase in adoption of micro-RNA in emerging economies such as China, India and others, will create new opportunities for global micro-RNA market. However, higher cost of the research and development, and lack of skilled professionals are the key restraints for global micro-RNA market. Geographically North America dominated global micro-RNA market, with approximately half of the world’s procedures being done in the U.S. because of high medical reimbursement facilities, support from government, and technological advancement. Asia Pacific is projected to have fastest growth, owing to rapidly increasing population, rise in consumer awareness, favourable government policies, modernization of healthcare infrastructure, and growing investments by the foreign countries in developing nations such as China, and India in this region. Among all the tools, Quantitative real time PCR (qRT-PCR) has the highest market share in global micro-RNA market due to higher prevalence of cancer patients. This report identifies the global micro-RNA market size in for the year 2014-2016, and forecast of the same for year 2021. 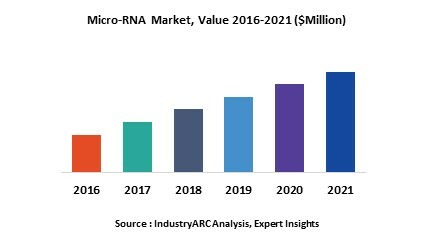 It also highlights the market drivers, restraints, growth indicators, challenges, and other key aspects with respect to global micro-RNA market. 10.3. Thermo Fisher Scientific Inc.
10.4. Merck & Co. Inc.